Adam Smith, 18th-century philosopher and political economist, was born in Kirkcaldy, Scotland, in 1723. Best known for his classic treatise An Inquiry Into the Nature and Causes of the Wealth of Nations, he is credited with establishing the discipline of political economics. The ideas put forward in his work represented a radical departure from the then-dominant economic policy and philosophy of mercantilism, which had held sway in Europe for three centuries. So profound was the impact of Wealth of Nations that it is generally considered the most important economic work ever written. Terms that are commonly used today, such as “invisible hand” and “division of labor,” had their genesis in Smith’s treatise. At the age of 14 he began his formal studies at the University of Glasgow, a center of the so-called Scottish Enlightenment. He was apparently greatly influenced by Scottish philosopher Francis Hutcheson, whose theories on moral sense were a basis for Smith’s own ethical speculations later in life. Smith furthered his studies at Oxford for seven years and during this period became attracted to the atheistic ideas of another Scottish philosopher, David Hume, with whom he would later form a close friendship. Returning to Scotland after his studies, Smith became a lecturer and professor, but more importantly, he was exposed to the intellectual public and began to attract the attention of opinion makers. In 1759 he published Theory of Moral Sentiments. Its focus was man’s ability to make moral judgments considering his natural propensity toward self-interest and self-preservation—ideas that would later resurface in Wealth of Nations. In 1763 he withdrew from his post at the University of Glasgow and assumed the position of private tutor to Henry Scott, Third Duke of Buccleuch, whom he was to accompany on a tour of continental Europe from 1764 to ’66. Through this experience Smith gained important contacts with French intellectuals, including Voltaire, as well as firsthand exposure to the French economic policy of mercantilism. The policy advocated government control over industry and trade based on the theory that the nation would be strong as long as exports exceeded imports. France was not oblivious to the economic influence exerted by the comparatively small maritime powers of England and Holland. Realizing that wealth was power, and that wealth was made in trade and manufacture, France sought to secure advantages for its domestic market through laws designed to protect its manufacturers. Smith objected to the French government’s interference in free trade through prohibitive duties on foreign goods. Many of his ideas in Wealth of Nations no doubt began to coalesce during this period. The philosopher returned to Scotland in 1766 and set about completing the work that would earn him enduring fame. Ten years in the making, Wealth of Nations was published in 1776 and is considered the first great work in political economics—the science of rules for the production, accumulation, distribution and consumption of wealth. One of Smith’s initial observations was that production was enhanced by the assigning of specific tasks to individual workers. This division of labor would maximize production by allowing workers to specialize in discrete aspects of the production process. He saw in the division of labor and in expanding markets virtually limitless possibilities for the expansion of wealth through manufacture and trade. Smith also argued that capital for the production and distribution of wealth could work most effectively in the absence of government interference. Such a laissez-faire—that is, “leave alone” or “allow to be”—policy (a term popularized by Wealth of Nations) would, in his opinion, encourage the most efficient operation of private and commercial enterprises. He was not against government involvement in public projects too large for private investment, but rather objected to its meddling in the market mechanism. He also held that individuals acting in their own self-interest would naturally seek out economic activities that provided the greatest financial rewards. Smith was convinced that this self-interest would in turn maximize the economic well-being of society as a whole (see “The Achilles Heel of Capitalism”). One particularly radical view in Wealth of Nations was that wealth lay not in gold but in the productive capacity of all people, each seeking to benefit from his or her own labors. This democratic view flew in the face of royal treasuries, privileges of the aristocracy, or prerogatives doled out to merchants, farmers and working guilds. It is not coincidental that such democratic, egalitarian views arose simultaneously with the American Revolution and only just preceded the French Revolution of 1789. Smith believed that the true wealth of a nation came from the labor of all people and that the flow of goods and services constituted the ultimate aim and end of economic life. 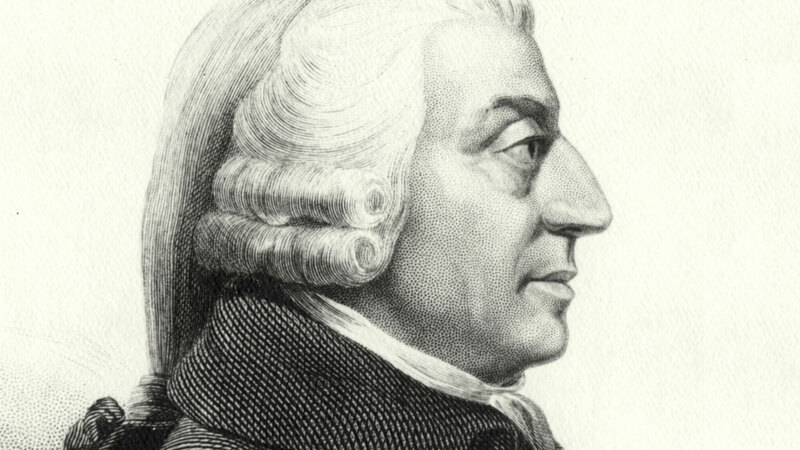 Modern capitalism traces its roots to Adam Smith and his Wealth of Nations, which has served, perhaps more than any other economic work, as a guide to the formulation of nations’ economic policies. Subsequent theories have altered governments’ role in economic policy, particularly the Keynesian ideas of the 20th century. Notwithstanding, Smith and his theories continue to occupy an important position in the development of economic thought. John Maynard Keynes: Capitalism's Savior?